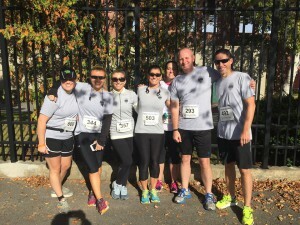 Members of the Rye Police Department, along with friends and family, ran in the Footrace for the Fallen in Manchester on Sunday 10/11/15. 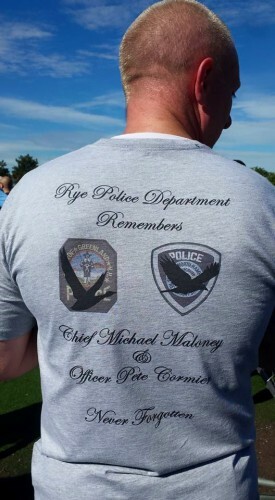 We created these shirts for the race to honor Chief Michael Maloney and Ofc. Peter Cormier. We received positive feedback and several inquiries about whether the shirts were for sale. While it wasn't our intent to sell the shirts, we see this as a great opportunity to raise money for the Officer Cormier Fund and support his family. The Rye Police Association will offer the shirts for $20 with all proceeds going directly to the fund. Please complete the form below to submit your request. We will contact you when the shirts are in. Chief Maloney is represented on the left, with the "grey goose" in front of the Greenland Police patch. Officer Cormier is represented on the right, with a "black bird" flying in front of the North Hampton Police Patch. The front of the shirt has a "Seacoast Patrol" badge with a blue line mourning band. 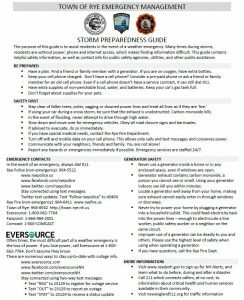 You will receive a follow up email for Paypal payments. If paying by check or money order, make payable to Rye Police Association 555 Washington Rd. Rye, NH. If yes, include your address below. What is the area code for NH?